Heat soup pot over medium heat with olive oil. Add chopped onions and garlic and cook until translucent. Meanwhile, cook turkey bacon, chop, then set aside. Add chopped cauliflower florets and chicken broth. Cover and let simmer until cauliflower is tender. Transfer into food processor or blender and blend until smooth, gradually adding unsweetened almond milk. Add juice of 1/2 a lemon and blend one more time. Serve with chopped turkey bacon and a bit of cheddar cheese on top. 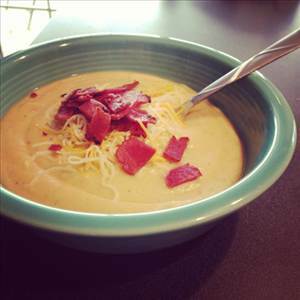 172 members have added this recipe to their cookbook. This soup is delicious! It has the taste and consistency similar to split pea soup. I added orange bell pepper and mushrooms to the onions when sauteing. There are 211 calories in 1 serving of Cauliflower Soup II. Calorie break-down: 49% fat, 33% carbs, 19% protein.